What is a Jam? - Jam sessions are often used by musicians as a social gathering and communal practice session. Jam sessions may be based upon existing songs, and jams are often loose gatherings of amateurs who get together to play music. Jams are fun times to play music with others. The Friday Morning Jams at Groth Music - These are jams, not lessons. However, the uke is so easy to play that even if you have never played before, we’ll show you simple chords to get you playing along right away. Need help playing the uke? Twin Cities Ukulele Club Friday Morning jams will start with a ﻿10:30 a.m. half hour basic workshop﻿. This is for those who are new uke players or who haven’t played uke much or recently. 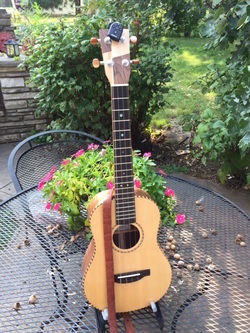 The whole idea is to introduce and practice chords, chord changes, 1 4 5, and other concepts to new or less experienced uke players before the jam. Then, we will start playing songs right at 11. Music in this jam is from the traditions that make up the American musical ethos; specifically those sounds that are come from tin pan alley, folk, cowboy, country and blues. We will use The Daily Ukulele: 365 Songs For Better Living "Yellow Book" as our primary source of songs. This book is available at Groth Music. Who - The jam emphasis will be on ukulele. This jam is geared for beginners to advanced uke players, with an emphasis an keeping things simple so all can participate right from the beginning. This Friday Morning jam is open to the public. ﻿Wh﻿at﻿ - A moderate paced Ukulele Jam. The jam focus will be on helping all jammers feel welcome and part of the jam - from the beginning. Where - Groth Music – 8056 Nicollet Ave S, Bloomington, MN 55420. Questions - Automatic No﻿tificati﻿on of Events - You may ask questions and sign up for automatic e-mail notification of the Twin Cities Ukulele Club jams by contacting TwinCities[email protected]. Check out the Twin Cities Uke Club Website Here!